Now with Rose-tone medical id tag. 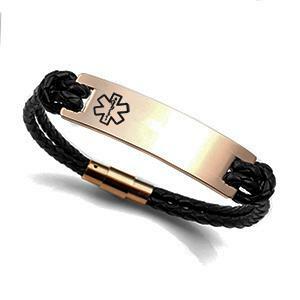 Our genuine leather medical alert bracelet is perfect for men or women with a wrist size of 6.5 to 8 inches. No further discounts are available on this product. WARNING: Magnetic clasp. Please do not order is you have a Pacemaker! 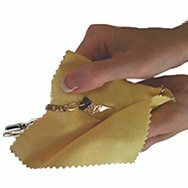 DO NOT ORDER IF YOU WRIST SIZE IS NOT LISTED BELOW - This item not available for resizing. Custom engraved in UPPERCASE block letters. Please leave spaces between words for clarity.